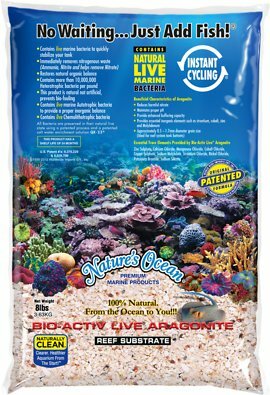 Because there’s no substitute for the real thing, build your saltwater aquarium display on the foundation of Nature's Ocean Bio-Activ Live Aragonite Natural Aquarium Substrate. This patented, premium-quality reef material is 100% natural from the ocean and contains live marine bacteria that quickly stabilizes your tank so you can add fish the same day you set it up. It eliminates nitrogenous waste and restores natural organic balance to provide a safe environment for your finned friends. The addition of live aragonite helps reduce harmful nitrate, maintain proper pH and enhance buffering capacity, while also providing essential inorganic elements needed to achieve and maintain pristine water quality. 100% real ocean reef substrate is collected in its natural environment using a patented process that preserves all bacteria in their natural live state. 10 million natural live marine heterrotophic, autotrophic and chemolithotrophic bacteria per pound provide proper inorganic balance. Instant cycling eliminates nitrogenous waste including ammonia and nitrite and restores natural organic balance to provide a safe environment. Live aragonite helps reduce harmful nitrate, maintain proper pH and enhance buffering capacity, along with providing essential inorganic elements. Granules measure 1.0-2.5 mm; also includes trace elements and critical nutrients needed to maintain ideal tank water quality. This product is intended for saltwater aquariums only. Use a minimum of 1-lb Bio-Activ Live Aragonite Live Sand per gallon of saltwater. Set up an appropriate filtering system and allow it to circulate. During the first month introduce no more than 1 inch of sand per 5 gallons of saltwater. The combination of sand along with all the small shells and shell fragments produces a very pleasing and realistic look. It did not cloud the water very much and the Gobies love it. I really appreciated the fact that I didn't have to spend any time rinising the substrate before use. Hopefully, it does not contain an over abundance of silicates. I'm going to order more for another reef tank. This is the second time I've used this Live Sand setting up Marine Tanks and it's just BEAUTIFUL! White sand with lots of Small Shells and the Bacteria helps it through the Cycling Process. It truly looks like a Ocean Beach, both my Damselfish and Gobies love carrying it around and moving it! This live sand is a fine grain with small shells in it. It's very pretty and looks great in the tank. I have a new saltwater tank and it has helped cycle it quickly. It wasn't very dusty at all, had slightly cloudy water for only a couple hours. I would definitely order again if I ever need more. Much better quality than what I've seen in the stores for the price.